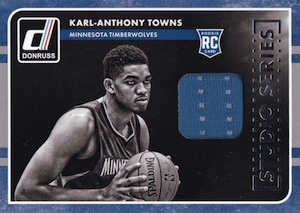 Although the NBA version of the brand does not have the same recognition as its baseball counterpart, 2015-16 Donruss Basketball takes a similar approach. 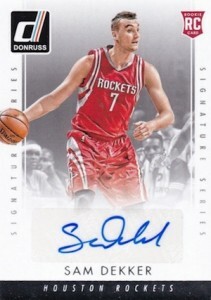 Hobby boxes promise three total autographs or memorabilia cards per box. Totaling 250 cards, the action-filled base set includes 200 veterans and 50 first-year players under the Rated Rookie banner. A variety of parallels are again in play, including new options that document points, assists and rebounds per game for players. 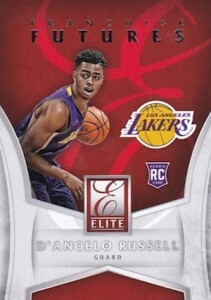 Familiar inserts fill the product, with hobby-exclusive Elite Dominator sets for both veterans and rookies and Elite Dominator Signatures (#'d) that add a sticker autograph. Other choices among the hits include a mix of autographed relics. Rookie Material Signatures Prime and Timeless Treasures Autograph Prime both pair a sticker autograph and small patch piece. Rated Rookie Signature Patches feature manufactured relic autographs that incorporate the Rated Rookie logo. 200 cards cards. Shop for base sets on eBay. See spreadsheet for specific print runs. Note: Not all subjects are featured in each parallel. See spreadsheet for specific print runs. This is my Product for 2015-16…I love the Design…and the Bruno Caboclo Au…. On the fence with this release. 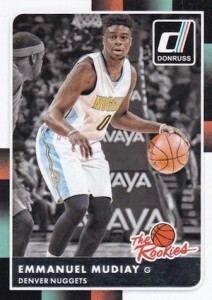 Bought two blaster boxes and drew rookie patch cards (Herzonja and Booker), and some decent inserts and base cards�BUT! Randomly picked up 3 packs (15 cards for $5each) at Walmart, and was disappointed � 2 of the packs had 4 players that were duplicate per pack, for a total of 8 duplicates out of 30 cards�not good. Someone made a mistake/their packaging machines need to be recalibrated. Three stars. Next year Panini. 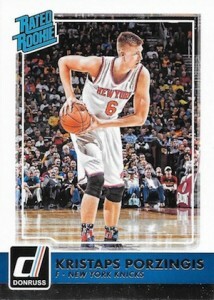 Bought one blaster box from Wal-Mart last night and pulled a Kristaps Porzingis Studio Series patch card #’d 25/25. Also pulled a Towns RC, a George Hill holo #’d /199, a LeBron James Scoring Kings and a bunch of other inserts. Are the blasters available at Target? inserts of Towns and Okafor. Love the set. The design is great. As usual the only problem is the set is too small. The spreadsheet posted is for Gold Standard. Billy Kingsley � Thanks! Not sure how that happened. Picked up two blasters last night. I was excited to try this product out and since it was buy one get one 50% off, I went for it. I pulled one auto and one jersey both from the same D league player. The think I didn’t like was the jersey card was messed up and the jersey was very off center so you could see the gap, and the amount of doubles I pulled was really bad. A couple of packs seemed to be for the most part player for player the exact same. 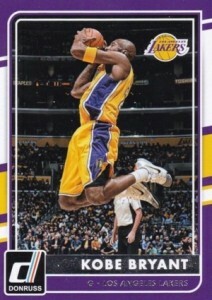 I did really like the design and overall look of the base cards, but I most likely wouldn’t buy anymore. Dan Richard � Signature Series is indeed an autograph set. Congrats! 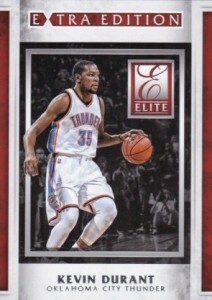 2015-16 Donruss Basketball Box w 3 Autos or Relic Cards!! !